If you’re looking for a straight stitch machine that can also excel in quilting and darning tasks, the Singer S16 Studio Industrial-Grade Sewing Machine should be your top choice! A heavy-grade, industrial machine without the high price, packed with great features that make sewing more convenient, quicker and most especially, more fun. Why choose the Singer S16 Studio Sewing Machine? The Singer S16 Studio is not just for those who are serious in the sewing business. In fact, this Singer product is made to provide industrial performance at a fraction of a cost! This means that sewing enthusiasts as well as home-based seamstresses or tailors can enjoy great value for the money with this machine. If you want a really straight stitching, the S16 will do a great job for you with its precision technology. You won’t have to worry about wobbly stitch lines. Complemented with the needle plate which is specially manufactured for sewing any type of fabric, you will totally have masterpieces at the end of the day. With sewing speed of 1,600 stitches/minute, you will be able to finish your projects fast especially when time is precious. The long arm structure of the S16 Studio makes it easy to complete large sewing projects such as draperies and most especially quilts. The S16 is packed with practical features that streamline the sewing process. For one, the knee lifter enables you to lower or raise the presser foot without using your hands. The automatic needle threader, the thread trimmer and the independent bobbin winding are big timesavers for anyone. Who should buy Singer S16 Studio Sewing Machine? The machine is perfect for professional sewers such as the dressmakers, tailors and seamstresses, among others. Singer S16 sewing machine will make a professional’s job much easier and quicker. 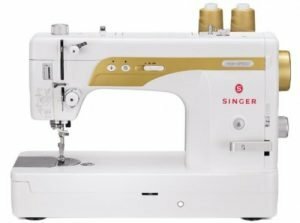 The sewing enthusiasts, among other creative individuals who are fond of fabric work, will also love the Singer S16 because there are so many features that help unleash one’s creativity. Specifically, the adjustable thread tension ensures consistent stitch quality on any type of fabric, the programmable end position of the needle is essential when making quilts and appliqué. The independent bobbin wiring system lets you sew continuously without having to stop just to refill a bobbin. This Singer machine is also a great investment for owners of small businesses such as alteration shops and dry cleaners. For a fraction of a cost of an industrial sewing machine, this Singer equipment definitely packs a lot of convenient features that allows these businesses to expand their service offerings without high costs. The machine is 20 inches in length, 9 inches in width and 14 inches in height, and weighs around 31.5 pounds. It has a long-arm design, giving you working space of as much as 9 inches length and 6 inches on the right side of the needle, ideal for large projects such as quilting. Convenient control lever for quick adjustment of speed control. Programmable end position of needle to ensure that needle is in up position when removing fabric afterwards or in down position when planning to pivot fabric. Has retractable guide and dual spool pins. It also has an automatic thread trimmer and reverse systems. Extra clearance for presser foot lifter, ideal for sewing layers and layers of thick fabric. Has built-in lights to illuminate working space. The quilting and sewing machine comes with a limited 25-year warranty from Singer. Here are more items that should come with this machine. The 4 presser feet, specifically: the all-purpose, standard foot; quarter inch presser foot; the free-motion presser feet; and the narrow rolled hem presser foot. 6 Best Brother Sewing Machine Reviews – Just what you Need! 5 Best Leather Sewing Machine – Design your Dream!